Actor Christopher Eccleston is to bring television's most famous time traveller, Doctor Who, back to the BBC after 15 years lost in space. The Guardian has learned that Eccleston, a Shakespearean actor who won acclaim for his portrayal of the son of God in the ITV series The Second Coming last year, signed the deal late yesterday. Russell T Davies, who wrote Queer as Folk and The Second Coming, is leading the writing team for the series, and has already delivered two episodes. BBC sources say the new version will look substantially different from previous incarnations. "Think Buffy the Vampire Slayer or Smallville: Superman the Early Years," said one BBC source involved in the production. "The production values are going to be high — we are doing this with serious money." Doctor Who ran continuously on the BBC between 1963 and 1989, with actors in the title role including Jon Per-twee and Tom Baker. In recent years, however, the time lord has appeared only in audio dramas broadcast on the BBC website, and was most recently played by Richard E Grant. The last time the doctor appeared on TV was in 1996, when he was played by Paul McGann. The earlier versions of the series won a large following and the Doctor's arch enemies, the Daleks, had such an im pact on cowering children across the country they were admitted to the Oxford English Dictionary. The series was mocked by some critics for its shaky sets and poor special effects but BBC insiders said production techniques had advanced substantially, and insisted viewers could expect to see more hi-tech villians this time round. "We could not get away with making it in the way it was made before. TV audiences wouldn't stand for it," the BBC source said. Russell T Davies has refused to rule out introducing a love element into the new series and the time lord's companion will talk to the Doctor about the plot of EastEnders and is rumoured to engage in flirty, sexual banter. Davies has said he has even considered changing the doctor's frilly, flamboyant image usually topped off with an eccentric, old-fashioned coat. In a recent interview he said: "I have a philosophy — I can do what I want. If we can think of the perfect story for him to fall in love then he will. "The purists may be up in arms, but there are more things to worry about in life. There is no pure Doctor Who. He is 41 years old — it is the,4 only way to do it, to change." Grant and McGann were among actors reportedly canvassed for the role before the BBC settled on Eccleston. The new series has been earmarked for Saturday nights on BBC1. Production begins later this year, but the new series will not seen until next year. APA 6th ed. : Taylor, Matt Wells and Matthew (2004-03-20). Shakespeare actor Eccleston reincarnated as Doctor Who. The Guardian . MLA 7th ed. : Taylor, Matt Wells and Matthew. 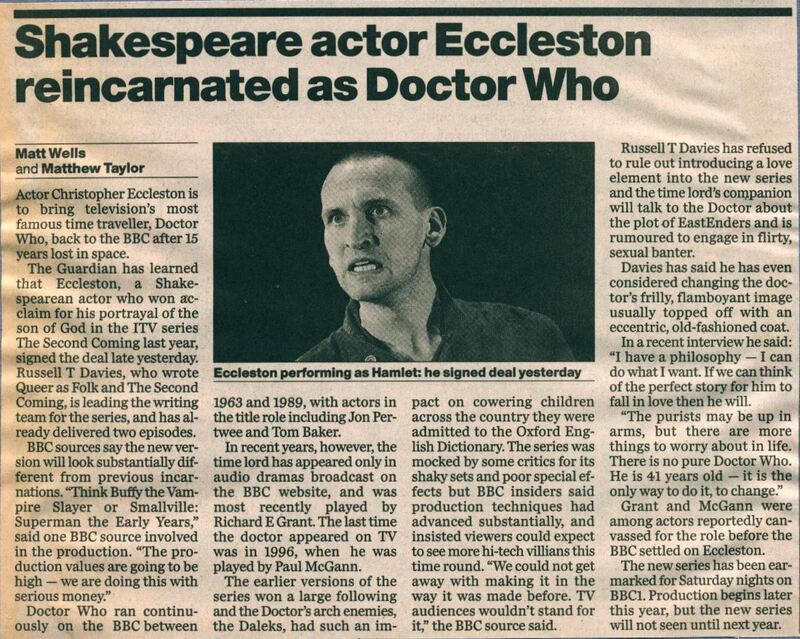 "Shakespeare actor Eccleston reincarnated as Doctor Who." The Guardian [add city] 2004-03-20. Print. Turabian: Taylor, Matt Wells and Matthew. "Shakespeare actor Eccleston reincarnated as Doctor Who." The Guardian, 2004-03-20, section, edition. This page was last modified on 1 February 2016, at 23:46.